What is the Highest Rank your Join Avenue can be? 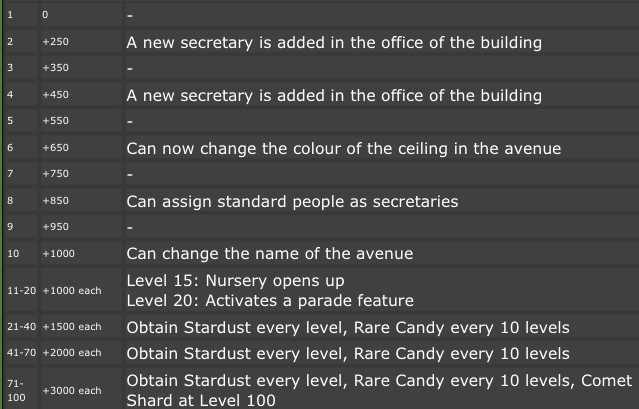 Also past Rank 10 do you get anymore extra perks? As for the perks, Yes. Do you get Join Avenue perks after rank 10? What is the highest rank you can get to in join avenue? Can a Join Avenue Rank rise twice? When Join Avenue is rank 100 what does the owner do/give you? Can the same Gym Leader visit your Join Avenue twice? In the Join Avenue is the a way to get rid of one of your shops?